Dental handpieces make the procedure more convenient for the dentist, more comfortable for the patient, and more efficient. 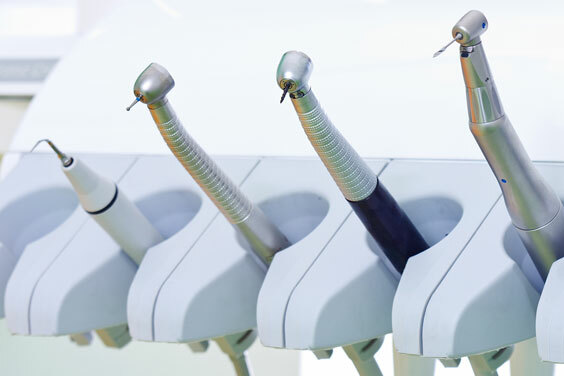 Types of dental handpieces include high-speed handpieces and low-speed handpieces, as well as specialist handpieces such as electric handpieces, surgical handpieces, air abrasion handpieces, and laser handpieces. High-speed handpieces are designed to efficiently cut teeth for procedures such as cavity filling, crown attachment, or bridge work. They can also be used to polish teeth after restorations. They attach to the dental unit via tubing, and are available with different styles of burs. High-speed handpieces can be fitted with lights at the head of the handpiece in situations where the dentist wants to illuminate the tooth or a particular part of the mouth. Slow-speed handpieces are used to remove decay, prepare a tooth for cavity filling, polish teeth, and adjust crowns, bridges, partials, and dentures. Slow-speed motors can be used with a straight attachment or long-shank straight burs, or with contra-angle handpiece attachments that are used with a variety of burs. A disposable prophy angle attachment can be put on a slow-speed motor. Attachments include a disposable prophy cup for polishing teeth and a disposable prophy brush for polishing occlusal and lingual surfaces. Electric handpieces can be fitted with a variety of burs depending upon their intended use, including burs for intraoral cavity preparation, burs for trimming provisional crowns, and burs for adjusting restorations, crowns, and bridges. Special electrical handpieces for surgical implants are also available. Air abrasion handpieces are attached to units that deliver a high pressure of alpha-alumina particles. This device is used for removing decay or preparing pit and fissure for sealants or restoration, and can also be used to prepare the occlusal surface for sealants. Laser handpieces use highly concentrated light to cut, vaporize, or cauterize soft tissue.